TransUnion credit agency reports that the national auto loan delinquency rate ended 2012 at a near historic low of 0.41%, down from 0.46% at the end of 2011. This is the ratio of borrowers that are 60 days or more overdue on their payments. 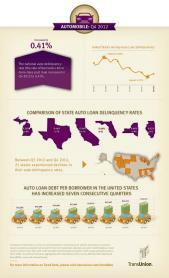 Auto debt per borrower continues to rise as the auto industry remains strong. This level increased to $13,747 in Q4, up 5.4% over the previous year. New loans were up 15.8 year over year and sub-prime loan originations have been increasing to nearly one third of overall auto loans since 2010 when the share of sub-prime auto loans was only 27.6%.